On the 7th (Sat), head outdoors with Scandinavian Adventures and then get outside with Seven Fells Up. To find traveler tips, more things to do, other places to visit, and tourist information, refer to the Akaslompolo trip planner . London, UK to Akaslompolo is an approximately 10-hour flight. You can also drive. Traveling from London to Akaslompolo, you'll lose 2 hours due to the time zone difference. Traveling from London in September, things will get a bit cooler in Akaslompolo: highs are around 13°C and lows about 5°C. Wrap up your sightseeing on the 7th (Sat) to allow time to drive to Inari. Kick off your visit on the 8th (Sun): get great views at Otsamo Fell, see the interesting displays at Siida, and then take in the architecture and atmosphere at Pielpajarvi Wilderness Church. To plan Inari vacation without wasting time, ask Inspirock to design an itinerary. Getting from Akaslompolo to Inari by car takes about 4 hours. Other options: take a bus; or take a bus. Expect a daytime high around 13°C in September, and nighttime lows around 4°C. Finish your sightseeing early on the 8th (Sun) so you can travel to Tampere. Start off your visit on the 9th (Mon): kick back and relax at Riihiniemen Uimaranta, soothe aching muscles at some of the top local wellness centers, and then enjoy some diversion at Pyynikki's Swim Hall. On the 10th (Tue), you'll have a packed day of sightseeing: kick back and relax at Rauhaniemi Beach, examine the collection at Vapriikin Museokeskus, then get your game on at Portaali VR, and finally take in the architecture and atmosphere at Church of St. Alexander Nevsky and St. Nicholas. To find reviews, where to stay, and other tourist information, read Tampere trip itinerary planning website . Getting from Inari to Tampere by combination of flight and train takes about 5.5 hours. Other options: do a combination of bus and flight; or drive. When traveling from Inari in September, plan for somewhat warmer days in Tampere, with highs around 17°C, while nights are about the same with lows around 7°C. Wrap up your sightseeing on the 10th (Tue) to allow time to drive to Pori. Pori is a city and municipality on the west coast of Finland. 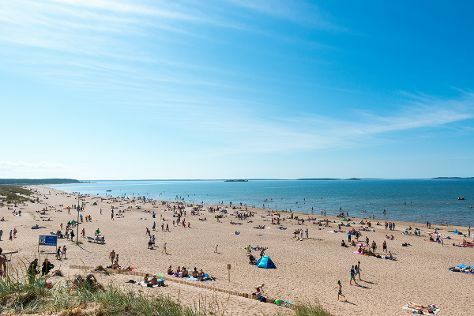 Kick off your visit on the 11th (Wed): kick back and relax at Herrainpaivat Beach, don't miss a visit to Juselius Mausoleum, and then enjoy the sand and surf at Yyteri Beach. To see reviews, more things to do, photos, and tourist information, read our Pori tour builder tool . You can drive from Tampere to Pori in 1.5 hours. Alternatively, you can take a train; or take a bus. In September in Pori, expect temperatures between 17°C during the day and 8°C at night. Wrap up your sightseeing on the 11th (Wed) to allow time to drive to Kotka. Kotka is a city and municipality of Finland.Kotka is located on the coast of the Gulf of Finland at the mouth of Kymi River and it is part of the Kymenlaakso region in southern Finland. On the 12th (Thu), head off the coast to Varissaari - Fort Elisabeth, kick back and relax at Beach Mansikkalahti, then wander the streets of Linden Esplanade, and finally step off the mainland to explore Lehman. For maps, reviews, photos, and other tourist information, refer to the Kotka day trip planning site . Drive from Pori to Kotka in 4.5 hours. Alternatively, you can take a train; or take a bus. September in Kotka sees daily highs of 17°C and lows of 9°C at night. Wrap up your sightseeing on the 12th (Thu) to allow time to drive to Helsinki. Kick off your visit on the 13th (Fri): admire the striking features of Rock Church, take a stroll through Katajanokka, expand your understanding of the military at Sea Fortress Suomenlinna, then take a stroll through Ullanlinna, and finally admire the masterpieces at Design Museum. Get ready for a full day of sightseeing on the next day: soothe aching muscles at some of the top local wellness centers, take in the architecture and atmosphere at Helsinki Cathedral, then contemplate in the serene atmosphere at Uspenskin Cathedral (Uspenskin Katedraali), then make a trip to Senate Square, and finally contemplate in the serene atmosphere at Kamppi Chapel of Silence. For where to stay, reviews, and other tourist information, read our Helsinki trip planner . You can drive from Kotka to Helsinki in 1.5 hours. Alternatively, you can take a bus. In September, daytime highs in Helsinki are 19°C, while nighttime lows are 8°C. Cap off your sightseeing on the 14th (Sat) early enough to travel back home.